I was very happy with how my level 3 went with Parenta. Jeanette was extremely helpful and supported me throughout the course of the year. Jeanette responded to any of my questions quickly and I believe she made it possible for me to complete my course on time. The support I receive from Parenta is always brilliant, thank you very much. Amie took my call this morning and was extremely helpful & professional in helping me out with my query. Amie talked me through the process whilst I was on the system to make sure I managed to complete the task. Lovely lady and I am extremely happy with the level of service she gave to me. Good evening, my name is Courtney and I recently completed my level 3 childcare qualification with Parenta and I’m emailing to say a massive “thank you” to Parenta for providing such a great level of service and education. My tutor, Cheryl, was absolutely amazing and I can’t express enough how fantastic she really was. She catered to my needs, not only with my hearing impairment, but I suffered with my mental health, and a few times thought about giving up my passion of working with children and giving up my qualification altogether, but Cheryl didn’t let me. She helped and guided me throughout it all, making time to always answer any queries no matter what time or day and she made sure I succeeded. Because Cheryl didn’t give up, I didn’t, and now I’m a level 3-qualified nursery practitioner and I love my job and because of your company, I proved to myself I can achieve! So again, I just want to say a massive “thank you” to Parenta for teaching me to become a knowledgeable practitioner. Hello my name is Shevonne I have just completed my level 3 with Parenta. I am partial sighted and struggle with computer work and need a lot of enlargement and readers. I would like to thank Tina on how amazingly I feel I was supported with all of my needs. I felt so confident that I would complete my level 3 with Tina Butler as an Assessor. She taught me to speak up and to overcome my anxiety, become a better leader. She believed in me, pushed me to go further when I struggled, she adapted all my assignments so that they were easier for me to see and complete. I do not think I would have been as confident completing this course without her so, I’d like to say “thank you”!! You welcomed me in September helped me every step of the way and believed in me; been supportive with work and with personal stuff and you all work really hard and go out of your way to help other people to. Been a slightly’ stressful time recently but everyone has kept it together! I’d like to share my appreciation of my team here in the South. As a newbie they have been nothing but supportive, welcoming and the nicest people to work with. This didn’t take too much thinking time! I joined Parenta in September 2018 and I am one of Carol’s team. This team is the definition of ‘work family’. I felt so welcome and supported from day 1. Even though we work remotely so don’t have a lot of time together, I know I can literally call on anyone in the team if I need help or guidance. Not only this, they make me smile and laugh, and that is very important on the harder days. I've used this software for a few years now and must say I know it inside out and use it with confidence... I would recommend it to anyone! Thank you Parenta for making the registration process for my out-of-school club so easy! Your customer service has excelled, and you are always happy to help, making me feel like a valued customer. Thank you so very much for all your hard work in re-designing our website and getting it online - it looks fabulous and several parents have commented on how professional and inviting it looks! Thanks so much for all your help with understanding the new 24+ learning loan. Whilst it sounded quite complicated to start with, jan helped me sort everything out and I love the course. Just wish I'd done it earlier. I am writing to express my deep appreciation and compliment one of your excellent employees for the attention and concern shown by her last week...I have always received quality service from all of your abacus team and Richelle’s extended help is a prime example of this. The distance you travelled and time you spent with us were such a good investment as the Parenta system has instantly solved my dilemma. We are very excited about the system and can`t wait to get started with it. It will solve so many admin issues and makes for a much more professional service and will save us so much time and effort. Just wanted to say how grateful I am for your assistance, you really put me at ease and made it a pleasant experience. I have enjoyed the course and not found it too hard. I have great delight in saying thank you to Alyson for all the work she put in for me and all the support she has given me as a learner and I feel she has helped me understand my role in greater depths. Please could you thank Celeste for her excellent tuition on the Abacus system, it was most informative. Very friendly &amp; enthusiastic. Very helpful and supportive and patient. Brilliant at answering all the questions. Very happy with the service. Thank you. Amy seems very knowledgeable about the system and has provided excellent training and support since our system has went live. The training was well organised and gave an excellent level of understanding of the system. I just want to express my gratitude to you for all your help, support and advice in achieving my goals at my course. Thank you so much, I am seriously indebted to you for the successfully in completing my course. I have to say that the support I receive, especially from Emma Reeves is quite exceptional...I have found the responses to my queries have been answered quickly, accurately and her help has been immeasurable in helping me set up our system. Big thank you to Lisa as I’m now half way through my TAQA and just starting my PTLLS at the same time. All this would not have been possible without her encouragement, help and support. As we have grown we have found ‘Abacus’ to be an invaluable part of our business in terms of reliability, user friendliness and adaptability to our requirements. The Parenta support team are just that, supportive and responsive, exactly what you need from your nursery management software provider. Thank you so much for sorting all this for us, it has made hiring an apprentice very pain free for the first time!! I would just like to say I wouldn't of changed this experience for anything. It has been a joy doing work here and meeting the people I have met on this experience. If I could tell others to come here and enjoy it like I have I would. The reason for my email though is to let you know how impressed I have been with the customer service I have received from Laura. She has been an absolute God send and has worked so hard to ensure that my invoices were correct so that I could send them out for the start of term. I want to say how much the Parenta website has helped us over the years. Thank you for your exemplary service. You have always answered queries promptly and efficiently. I would also like to say thank you for the amazing service that you provide with a friendly approach. I don't know if you and your colleagues are often told but the staff at Parenta are extremely helpful, with beautiful personalities and you are an absolute pleasure to work with. Parenta has become a bible and work sheet master plan at my Nursery I went both feet in and no plan B and I have never looked back the numbers cover years and give me a plan of action the staff you have - Amy, Luke &amp; Emma are amazing at looking after me and my system. I think that Clare has gone out of her way to help and I can't thank her enough. I think that the professional discussion with her has help me learn so much. I think she has a wonderful teaching style and think that she is up there with some of my favourite teachers. Amy, Emma and Luke are a great asset to your business. They are always friendly, always professional, incredibly patient and most importantly they know the database. I just wanted to take this opportunity to let you know how impressed I am with the level of service and consistent professional practice I have received from you and your company. Despite being offered a free version of alternative software from our local county council, we much prefer to use Abacus due to it's ease of use. Abacus has quite obviously been designed for USE by nursery staff, and not by computer experts. We would recommend Parenta and Abacus to anyone managing a nursery. It is a very clever and flexible tool, which helps us with day to day management of the nurseries, but also with forward planning. Thank you for your wonderful support and tuition during the past months. I really enjoyed working with you, had an excellent tutor, and I cannot think how you could have been better! Thank you so much for all your help, the support we get from Parenta is fantastic! Words cannot express the time and patience of Samantha Russell who set up a Parenta website for our nursery. Her on-going support has made us feel secure in the knowledge that she will help us maintain the website and ever-changing demands of advertising our local business. Well done to Janet for being an excellent Assessor and thank you to Parenta for giving me the opportunity to do this course thanks to your lovely staff it's been a very positive experience for me and I will recommend Parenta to any of my colleagues wishing to progress to Level 3, as I have. Your customer service is excellent. Always very helpful and easy to deal with. Also the software itself is great to use. Thank you for all your help recently and in the past year. Excellent service, as ever. Thank you for your patience! It has been a pleasure speaking and dealing with you today, it is so nice to speak to a friendly &amp; helpful voice on the end of the line. I look forward to dealing with the company in the next few months. Thank you for all your help, I really appreciate it. I am delighted with the whole service you offer from your initial sales team and ongoing support - excellent! The implementation of Parenta in our new nursery has proved its value from day one. It is quick and easy to get up and running, intuitive to use and the flexibility of the system is excellent. I personally have never found fault with the advice and support received from Parenta, especially Emma, who is quite an exceptional and talented young lady. she always goes that bit further to try and make sure that the job / task asked of her is understood correctly and that the response is what I, as a customer wants. I think that they are very good and helpful. Always feel my queries are answered and my assessor is fantastic. A great company and great support from my tutor. Quick and easy communication with help if needed. Course very easy to understand and set out well! Very helpful at all times and I’m so impressed with the service I have recommend Parenta to several people and will continue to do so. Clare has been such a great support, she put me at ease straight from the start. She has given me the support as and when I’ve needed it. Excellent and a good experience very professional and friendly and outstanding training experience. Love them. And love Pippa she is fab and always more than happy to help! She always has a smile on her face, which makes me happy when I see her. Thanks Pippa for all you’ve done for me. I completed my Level 3 with Sharon Aplin from Parenta Training. Sharon provided excellent service and provided lots of resources to help me achieve my level 3 qualification. I will definitely recommend Sharon. During my two years of being with Parenta my experience has been fanominal. Having Dawn Fryer as a tutor was the best thing I could have asked for, as she helped me through struggles that know one could have helped with. She also supported me with other issues outside of work and helped me with my course when I needed it. I couldn't have chosen a better company and tutor to complete my qualifications. Thankyou for everything. I will definitely be using Parenta for any future Training needs within my company and would be delighted if we were re-assigned Heather as our assessor again. We looked around at other management software but for us, Abacus was perfect because it ticked all our boxes. I enjoyed doing the course with Parenta. It was easy and convenient as it's all online, which helps especially when you have children. The teachers and staff are all wonderful and helpful. I have learnt new things and experiences. I have extensive knowledge in EYFS, child's development, safeguarding, ERR, different types of legislation, policy and procedures in the workplace, health and safety at work and first aid, amongst many more. I look forward to doing another course with Parenta and I also highly recommend courses with Parenta. I have just got off the phone to Amy, and I've got to say she as well as each and every one of you that we have spoken to (millions and millions of times) are absolutely amazing! The customer care at Parenta is second to none! You and your team are an absolute credit to the company! So excited about this website, thanks a million - Over the moon !!!! I used Parenta to get my Level 3. My tutor was Melanie Payne and she was great! She came and met me close to my home so it wasn’t far for me to travel; when my laptop broke we did discussions and she allowed me to do my work on her laptop. She really helped me - if I didn’t understand a question, she’d explain it in a different way for me to understand better. She was really helpful, I’m so pleased she was my tutor. My experience with Parenta has been one of the highlights of the year. Knowing the people who are providing the course I’m doing is encouraging. [They are] attentive, helpful and focused on being able to help me through the course. My assessor has been fantastic, encouraging, attentive to the needs I have, with studying to tutoring with the disabilities I have. My assessor is able to cater the work I do to help me and show me how to complete my course. I have successfully completed level 2 in early years child development and currently doing level 3 early years child development. I am so grateful for all that Parenta and my assessor have done for me. I feel that Pippa has been amazing. She has helped me through my work. If I’ve needed help she has helped me. Been there when I have needed her. Just like to say a big THANK YOU to you guys for allowing me to successfully complete my Level 3 childcare course. To many, it’s only a certificate but I feel as if I’ve been awarded a Bachelor’s or PHD! Special thanks to my first assessor Keeley McCausland - I must say she was REALLLLY great and always motivated me to try. Despite her leaving before I completed my course, I must say that Tina Butler is really good and I’m happy she stood in the gap…Thanks to everyone from Parenta now I’m a step closer to become a paediatric nurse. Good news, Grace has been offered the apprenticeship at Early Years Academy. I understand the nursery have contacted you at Parenta and have already got the process started for Grace to begin her training with you. I want to take this opportunity to thank you Rebecca for all your help and support. Absolutely delighted with our new website. Can’t thank Samantha from Parenta enough for her patience and understanding. We really wanted our webpage to be something special to capture our business. We were fussy about changing photos, different sections and how we wanted it to look. During the rebuild of our new design, we would send constant emails with photos and bits of information - quite a task. Nothing was too much trouble to alter or add to the site and our emails were responded to so quickly, most often the same day. We have had so many compliments about the new website and, most importantly to us, people tell us how easy and efficient it is to navigate. The help didn’t end once the site went live. Samantha offered to help with any support we might need to enhance our features at a later date, such as new photographs in the summer and a little video too. Angela is my assessor for my level 3 in childcare. She helps me through any problems and enquiries I have about any work and [tells me] to always have confidence in myself. She is very friendly, and doesn’t make me feel like I’m doing something wrong, she helps me along the way. Amazing support for students and made easily accessible for students who are juggling work, parent life and other commitments. This is the second BTEC I have taken through Parenta and [I] have had the same tutor both times. Her support has been incredible - she has always gone over and above to help me. It has been a joy to work with her, she is a credit to your company. Excellent. The response for requests for support is prompt and positive. The students in Year 9 who attended the Careers Fair make the most of the Parenta stand and the information they share. Year 13 students who are thinking of apprenticeships in childcare were supported. I am in my late thirties and doing a level 3 I thought would be quite challenging as it has been a long time since I wrote assignments but the support I have been given from my tutor has given me confidence to fulfill this qualification. I am thoroughly impressed and happy with Parenta. I have found my tutor and Parenta have helped me achieve my goals and ambitions and support me to the best of their ability. Service is very good, professional and I like the online learning because it’s helped me to organize [my] time. Communication is excellent and I am happy [to] use this service. Parenta services are great at supporting, giving advice and support where needed. Ecordia is an easy and clear website to upload work. Excellent. Amelia was really helpful to all of our students who came to speak to her at our careers fair. She was very friendly and gave our students lots of information, advice & guidance about Parenta and the apprenticeships you offer. Amelia also had lots of excellent handouts for our students and emailed me information about the opportunity structures that I could continue to use with students that may not have been able to attend the event. The support from Amelia has been fantastic and proved extremely popular with our students. We hope to see her again at our next event. I would like to say thank you to my tutor Charlie Gordon for her support throughout my level 2 childcare qualification. She has been amazing. Charlie always made me feel at ease and I was able to confidently approach Charlie about anything that I was not too sure about and she was always there to answer my questions. Charlie was such an amazing tutor to work with. I completed the Level 3 Early Years Educator course 2017/18. I found the support from my tutor (Fiona) invaluable. She provided me with excellent resources to complete my assignments and was always very clear about her expectations. She was always available if help was required and marked my work very promptly even if it was sent through to her late at night, it was usually marked by the next day! The workload was manageable alongside my daytime job and tutor visits were flexible. I would definitely recommend Parenta for this course. I really enjoy my course and from one side I [feel] sad I am going to finish it. My assessor Nicky Newport was very nice and helpful. I always could ask her for help or support. I have had [an] amazing experience with Parenta. This was not my own assessor, but Sharon Aplin - I only meet her through doing my Functional Skills. I had a lot problems with my own assessor, [however] Sharon supported and listened to me. Once my assessor left, I should have been worried, but I was not as Sharon kept me fully informed on my course and told me I would be assigned a new assessor. I had 100% faith because of Sharon Aplin. I am now finished and would like Sharon to know how amazing at her job she is and to thank her for everything she has done for me. I’m looking forward to starting my level 5 and Sharon will be my assessor. The service is great and Amelia is very smiley and bubbly. We will be sure to invite Parenta to our next event as they offer such great opportunities for our residents. I’ve got on really well with my level 3 through Parenta and I’ve received a lot of support and help from my tutor and I’m very thankful for that. I would recommend Parenta to future learners. Sharon was great. [She] helped with any problems I had, always replied promptly to my emails and gave guidance when needed. I am very happy with the help and support I get off Julia. This is a great course to do and I am refreshing my knowledge as well as adding to it. Rebecca was amazing at helping me to find an apprenticeship and was so nice and helpful and I am truly grateful for the service. I usually speak to Amy & Ellie and they are absolutely amazing. So helpful, professional, polite & patient. A big thanks to them both. I am feeling confident that with continual support from Angela that I will succeed in completing my course. I know I can contact her and she will help me with anything I need. Parenta attended our recent annual Careers Fair. Amelia was professional and interacted well with all our students. Many students requested further information on apprenticeships and we will continue to work with Parenta especially between September 2018 and February 2019 when our Year 11 students will be choosing and finalising their post-16 plans. We will ask Parenta to attend next year’s fair. Thank you, your support of our students is much appreciated. Really useful to inspire students and motivate them to consider [a] career in childcare. Rosie is always so customer-focused and always makes everything better, when my user error has made it go wrong. Thank you. Thank you so much for your help and ongoing support. As someone who is still learning about Parenta, I am exceedingly happy with the support that I have had lately. I have been working in Early Years for over 20 years. I was approached by Pam who recommended the level 5. I am a full-time manager of a very busy setting and wasn’t optimistic at how I was going to fit in the study time. Pam, from the beginning, made me believe in my own abilities. The way the course is set out and managed really supported my learning style. I have thoroughly loved learning with such an incredible mentor. Pam has so much passion in Early Years which inspired and motivated me throughout the course. I would highly recommend Parenta to others seeking to develop their skills and knowledge further. Thanks Ellie. I always find you helpful and patient with any issues I have! I have just completed a level 3 early years qualification with Parenta. I am emailing as I would like to acknowledge the excellent support I received from Jeanette Arnold, my assessor. Jeanette responded quickly to any queries I had regarding assignments and observations and was also very understanding on the couple of occasions I had to re-arrange due to staffing issues at my setting, meaning I couldn’t be out of ratio. I have thanked Jeanette personally but felt I needed to make you aware of the brilliant job she has done in supporting me throughout my study. She is an asset to Parenta 🙂 Thanks again. We have used the Parenta software for a few years now and love using it. Yes like any system it will not do everything that you want, however, email the team your suggestions and they will put it forward to the tech guys and programmers to see if it possible to add. I love working with the team, making suggestions, learning what the system does. The team really do listen to what you want and are willing to help. Goodness knows how many times I have rung them for advice, and they always happy to assist (even when I’m the problem!) 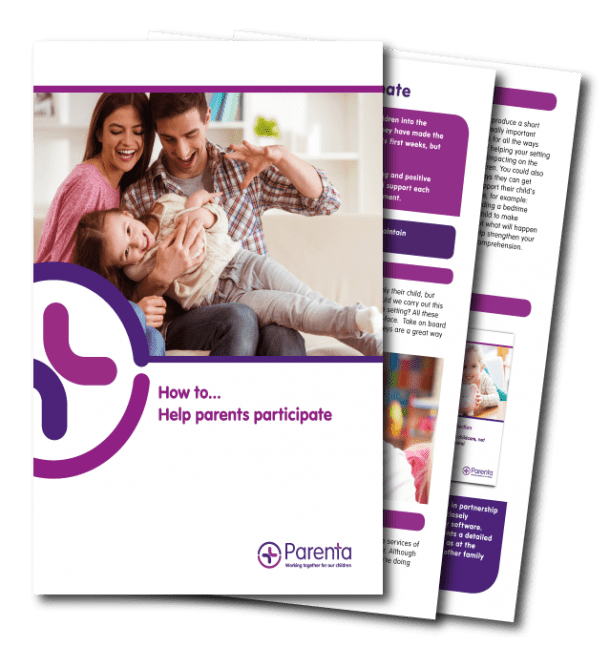 The services that Parenta offer are amazing from, producing an amazing magazine (of which I have only recently discovered) and it is full of valuable information, ideas, awards, news, and involving practitioners to have their say too. My staff find the system easy to use, reducing paperwork and freeing up time to really be involved with the children. Parents say they look forward to their daily emails, as they are clearly set up, easy to read and fun. We also use Parenta for our training and again I cannot fault the high-quality service and support they provide. We have been luckily enough to have the same assessor (Emma) which is important to my team as she really understands the different learning styles everyone has and she seamlessly adapts her training to support individuals. This is a team that really care from the cleaners to the CEO's of the company, they work together to provide a professional and well delivered services of which I cannot fault. I love working with them, they embrace change and challenges and really do make the time to build on relationships with their clients. I know it sounds like I am on a commission to say nice things, but this is genuine, I really do not have anything negative to say. Enough grovelling, try the system for yourselves. The content of your magazine is of a high quality, always relevant and really engaging. Your team seem to understand what the sector concerns and needs are and the photography and graphics are lovely. I share the contents with my team which they have found informative and will actively implement things they have found interesting within the setting. More importantly, your willingness to share business strategies with the sector is really helpful during this very difficult time for us all. So it’s a big thank you from me. Emma, as always, was polite, patient and thorough in explaining each stage of the training. It was a great help, thank you! We always have a fast friendly service. Well done Ellie, you are a superstar and keep up the fabulous service you offer. been able to move away from childminding and since September of this year, I have been working as a SEN Teaching Assistant in a secondary school which I am absolutely loving. Angela Williams, our assessor, is fantastic. An excellent tutor and mentor. Absolutely amazing. I completed my level 2 with Sharon as my Assessor two years ago and now I’ve begun my level 3 with Sharon also. Sharon is such a huge support to me, guiding me and giving me the confidence to believe I can do it. I can’t imagine anyone better than her to be my assessor, I’m forever recommending Parenta and Sharon. Absolute star that lady! I have had amazing experience with Parenta, This was not my own assessor, but Sharon Aplin, I only meet her through doing my functional skills, I had a lot problems with my own assessor, Sharon supported and listened to me, once my assessor left, I should of been worried, but I was not as Sharon kept me fully informed on my course and told me I would be assigned a new assessor, I had 100% faith because of Sharon Aplin. I am now finished and would like Sharon to know how amazing at her job she is, And to thank her for everything she has done for me. I’m looking forward to starting my level 5 and Sharon will be my assessor. Really helpful, if you ever need anything then tutors are always an email or phone call away and get back to you really quickly. Linda, my assessor, was brilliant. She helped me whenever I needed it and I rarely had to ask for guidance as she always gave it to me and more. I think they're exceptionally good. I think the services are really good and Angela is very helpful. The course I did was very informative and helped me draw on previous experience and carry subjects learnt into my old job. During the course I lost my job my tutor Clare Drew was amazing at helping me stay positive and focus on getting the tasks completed to finish the course along with Julie Norton and Sarah Ghetter I was able to complete my maths functional skills something that has held back my confidence previously. I passed after three attempts and they were all really happy as they know I worked hard to achieve the success. I am able to carry forward everything learnt into new roles in my new career paths. Thank you Patenta and to Clare Drew for believing in me. Fantastic, helpful, experienced. Tutors who are understanding and supportive. Brilliant! Pippa is absolutely amazing. I’m near the end of my course, and I wouldn’t have been able to do this without the guidance and help received from her. Anytime I have needed help, if struggling (the odd time, even on a weekend) Pippa has been there and got back in touch with me, within a few hours, at the most. I was worrying, as I had to go on maternity leave and about how I was going to get back into the swing of things when I returned and Pippa has provided nothing but amazing support and organisation and I couldn’t be more thankful. Parenta really have a great member of the team with Pippa, and would highly recommend her to anyone! Thank you so much for all you have done so far and what you will continue to do, you really are an incredible assessor and you and everyone else should be so proud! I love my assessor Pippa Caine, she is amazing! Pippa has tailor made my course to fit around me as a individual to make sure I succeed. She is an asset to your company. I found the internet portals an added farce and distracting and it is only through Pippa stream lining the course into a straight line of contact between her and myself I found it manageable. She has gone above and beyond her job role to show understanding, compassion, enthusiasm and support as a assessor. I found this course daunting as I have a SEN so even though my confidence as a child care practitioner is there at work and I strive to seek and utilize my knowledge, I find it hard to put it onto paper . This is where Pippa has given me confidence to improve my career prospects on what I can achieve after years of self doubt. I will always be thankful for what she has done and the positive affects she has had on my life not just for me but in turn for what prospects I may now be able to give my children through gaining my qualifications and the tools this has given me to help support my parenting. Parenta are fantastic ! I chose to do my apprenticeship with them after a lot of research because they ticked all the boxes I was looking for. They have met all expectations. My tutor/assessor Angela is brilliant, very supportive and encouraging. My confidence has grown and I am learning new skills and excited to achieve my goal of a new qualification soon. Highly recommend Patenta! Thank you. Excellent. I couldn't be happier with the support and encouragement I have received. Pippa is an outstanding tutor, and a credit to Parenta. Thank you Holly you really are a lovely person and I’m glad you are my tutor! Our Assessor, Heather Gamble, was really supportive & encouraging. Always at the end of the phone when needed for a query or assistance. Really lovely lady. Our nursery has been supported by Parenta’s software and now Parenta’s apprenticeship training since we began, 3 years ago. Your services have been invaluable in helping us build our wonderful nursery. We are now fully occupied (and have been for some time) with a waiting list for every age group! Our nursery has a distinctive ethos, putting children’s individual needs at our heart. We believe in natural resources, following children’s own interests to help them reach their own learning potential as well as giving them plenty of outdoor time in our all weather, astro-turf garden. I want to say how much the Parenta website has helped us over the years.Thank you for your exemplary service. You have always answered queries promptly and efficiently. Thank you so much! It really does look amazing, and you have completely exceeded my expectations.